A paid canvasser supporting Wisconsin Governor Scott Walker before the recall election has been implicated in a "voter fraud" allegation. But despite claims by Walker and his allies, there is still no evidence of a systemic effort to fraudulently change election outcomes. Paid, Pro-Walker Canvassers. Governor Walker has insisted on his strong grassroots support throughout the effort to recall him, even as he depends on unprecedented levels of donations from wealthy out-of-state donors and benefits from secretly-funded ads and bus tours timed to coincide with the election. Despite Walker&apos;s financial support, a CNN reporter embedded with one of the Tea Party bus tours said the rallies "haven&apos;t really had the biggest crowds I&apos;ve seen ... some of them have had as few as 25 people, others have been maybe about 100 or 150 people." Additionally, recent reports indicate that not enough Walker supporters are volunteering for the campaign -- even in Republican-friendly Waukesha County, the GOP has to pay people to canvass on Walker&apos;s behalf. 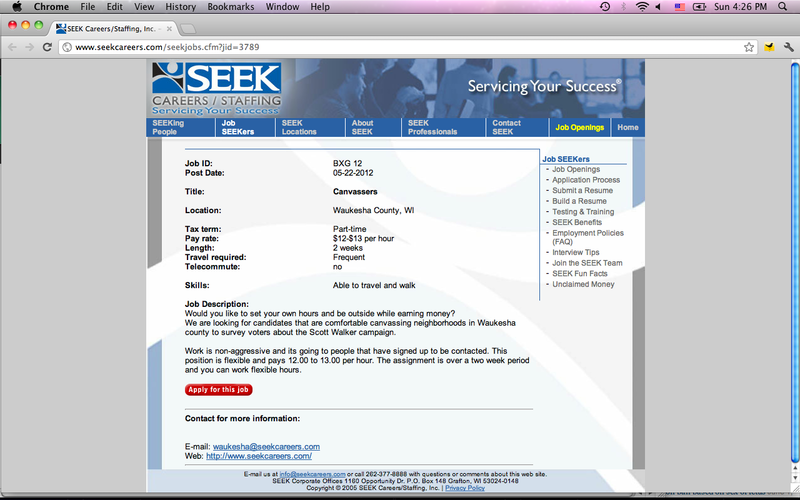 In recent weeks, job postings for canvass workers who "must not have signed the recall petition" have appeared on Craigslist and the temporary hiring agency Seek Careers/Staffing website, offering people $12 to $13 an hour to canvass "neighborhoods in Waukesha county to survey voters about the Scott Walker campaign." Reports have also emerged about some being paid between $100 and $500 to put "Stand with Scott Walker" signs on their property. Walker got 71.5 percent of Waukesha County&apos;s vote in 2010 -- indeed, it is the most solidly Republican countyin Wisconsin -- but apparently the GOP can&apos;t find enough volunteers in the county to work for Walker without pay. Reports have recently emerged that a paid canvasser in Waukesha County engaged in questionable election activities. GOP "Vote Fraud?" Last week, the election clerk for the City of Delafield (in Waukesha County) reported a suspected case of vote fraud as the result of a paid pro-Walker canvasser going door-to-door in the area and purportedly helping people request absentee ballots. However, at least three people apparently had not been informed what they were signing. One man who signed the canvasser&apos;s form went to vote early, and when confronted about potential double-voting, said he did not know he had requested an absentee ballot. "The guy at the door handed him Walker information and told (the man) the more signatures he got, the more commission he made," said Delafield City Clerk Gina Gresch in an interview with the Lake Country Reporter. When the City Clerk followed up with two other addresses that had requested absentee ballots, the individuals said they had never made such a request. Never mind that "one or two points" in an election where 3 million people cast ballots would amount to between 30,000 and 60,000 fraudulent votes, and a year-long, in-depth investigation into the 2008 election in twelve Wisconsin counties by the the state&apos;s Republican Attorney General netted just 20 charges. Vote Fraud Still a Fraud. Priebus and Walker were raising the spectre of voter fraud by Democrats, in areas with high populations of color -- Priebus specifically referenced Milwaukee and Kenosha -- but not in the Republican stronghold of Waukesha County. Regardless of where it happened and by whom, the alleged "voter fraud" in Delafield involved an absentee ballot and would not have been prevented by requiring picture identification at the polls. Additionally, the Delafield incident may not have been "fraud" at all -- there is no indication that it involved an intentional effort to alter election results, and even if it were, it does not look like part of a systematic effort that could successfully result in tens of thousands of fraudulent votes being counted without detection. It looks more like the result of a paid pro-Walker canvasser getting over-eager in an attempt to earn a buck. Similarly, almost none of the charges stemming from Wisconsin&apos;s investigation into the 2008 elections actually involved "voter fraud," which is defined by the Brennan Center for Justice as a person casting a ballot "despite knowing that they are ineligible to vote, in an attempt to defraud the election system." The vast majority of those charges involved felons on parole or probation who cast single ballots in their own name but did not know they were prohibited from voting. Although felon voting constitutes "election fraud" under Wisconsin statutes, it does not meet the more precise definition of "voter fraud." Only two individuals were charged after the 2008 elections with committing the kind of in-person "voter fraud" that stricter identification requirements might prevent. In an interview with Fox News network, Center for Media and Democracy&apos;s Executive Director Lisa Graves asked Priebus and Walker to apologize to the people of Wisconsin for irresponsibly suggesting that their elections are marked by tens of thousands of fraudulent votes by Democratic voters, despite the Republican Attorney General identifying hardly any fraud after a thorough investigation. 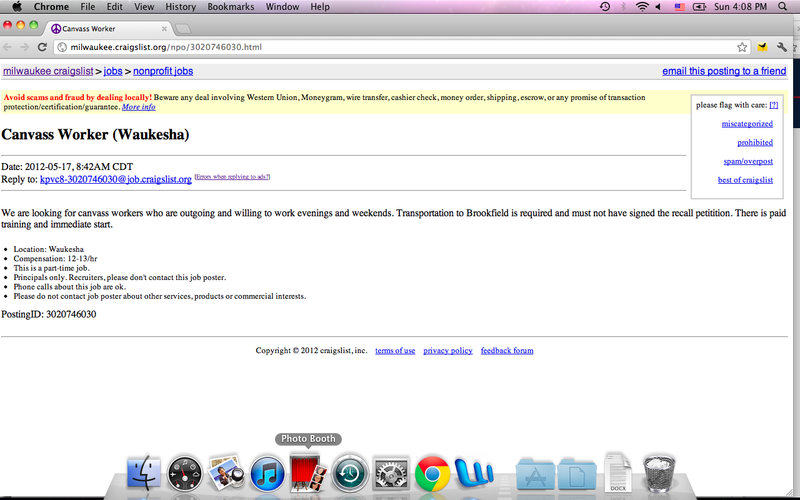 CMD is still awaiting a response. A version of this article originally appeared on PR Watch.